CBS News Reporter Tali Aronsky is traveling with the Lieberman campaign. If the look on the face of Jano Cabrera - spokesman for presidential candidate Joe Lieberman - was any indication, "dejection" was the mood of the Lieberman team on primary night in New Hampshire. As one would expect, the rest of the staff is already starting to spin Lieberman's lackluster results. And they're blaming the media, in part. 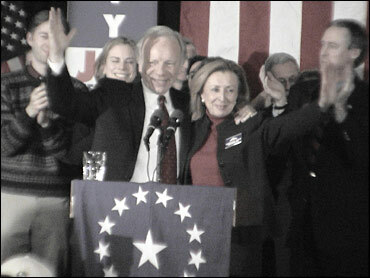 "Lieberman did better than expected," said Peter Greenberger, director of the Connecticut senator's campaign in New Hampshire, commenting in the late stages of the vote count. "Considering that the media wrote him off and most outlets were calling it a four-way race, coming in at ten percent is a breakthrough." The ten percent for Lieberman eroded somewhat a few hours later as more precincts returned their votes. With 97 percent of the precincts reporting, the vote was 39 percent for Massachusetts Sen. John Kerry, 26 percent for former Vermont Gov. Howard Dean, 12 percent for retired Gen. Wesley Clark, 12 percent for Rep. John Edwards, 9 percent for Lieberman, 1 percent for Rep. Dennis Kucinich, and 1 percent for all other candidates combined. But that news had yet to materialize at campaign headquarters as Lieberman addressed supporters after Kerry claimed victory. The senator was upbeat and on message as he ran up the stairs to give the speech campaign workers were waiting to hear. Lieberman - a New Englander, like first and second place winners Kerry and Dean - went on to frame those strong showings regionally, observing that "New Hampshire's neighbors received most of the vote." The senator then elevated his campaign to the level of a cause, "a cause for mainstream America... for a politics that puts national interests in front of special interests and partisanship." The only hitch that this optimistic presidential candidate sees in the near future is the snowstorm building up along the Northeast coast, which convinced him to postpone the trip to Delaware that was supposed to be the next stop after New Hampshire. "Friends, I'm getting on a plane and we're going to Oklahoma," said the senator, refraining from breaking into song as he pointed his campaign towards Oklahoma City. "Oklahoma - where the wind, but fortunately not the snow - comes sweeping down the plains." And down is where Lieberman is in the latest election results. "Our cause is just and it is necessary," said the senator and former vice presidential candidate, looking ahead to the new faces and fresh ears in the February 3rd primary states. "We will take this cause to the rest of America." How did this crowd take it? Don Byrne said he was "disappointed" but feels that "once again, New Hampshire voters have framed the important issues in the upcoming presidential debate," namely, healthcare and jobs. Donna Soucy did not take the same holistic approach: "I'm proud of Joe's campaign but I feel that the press turned it into a four-way race and discounted Joe's candidacy from the get-go." Mark Rosenbaum, a volunteer from Princeton University, was still pumped up. "It's still early. You gotta remain optimistic... the numbers are still better than expected." Proving once again that success, like beauty, is in the eye of the beholder.